We help business executives understand the risks and opportunities of climate change. by nominating for an award. CLIMATE ALLIANCE HELPS COMPANY DIRECTORS AND BUSINESS EXECUTIVES MORE EASILY INFORM THEMSELVES ABOUT THE OPPORTUNITIES AND RISKS PRESENTED BY CLIMATE CHANGE. Business Leader of the Year 2018 - Sanjeev Gupta, Executive Chairman and CEO of GFG Alliance, represented by Marc Barrington, CEO of SIMEC Zen Energy with Turlough Guerin, Chairman of the Climate Alliance Board of Advisors. 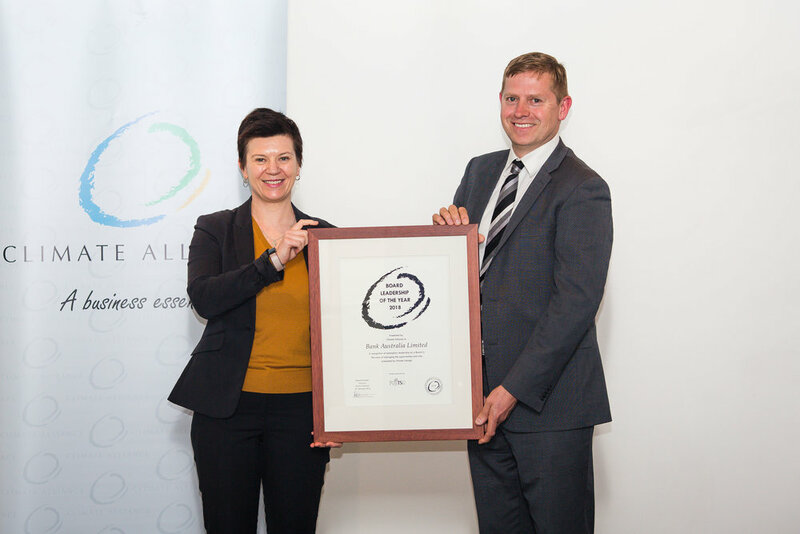 Board Leadership of the Year 2018 - Bank Australia, represented by Fiona Nixon, Head of Corporate Affairs with Turlough Guerin, Chairman of the Climate Alliance Board of Advisors. 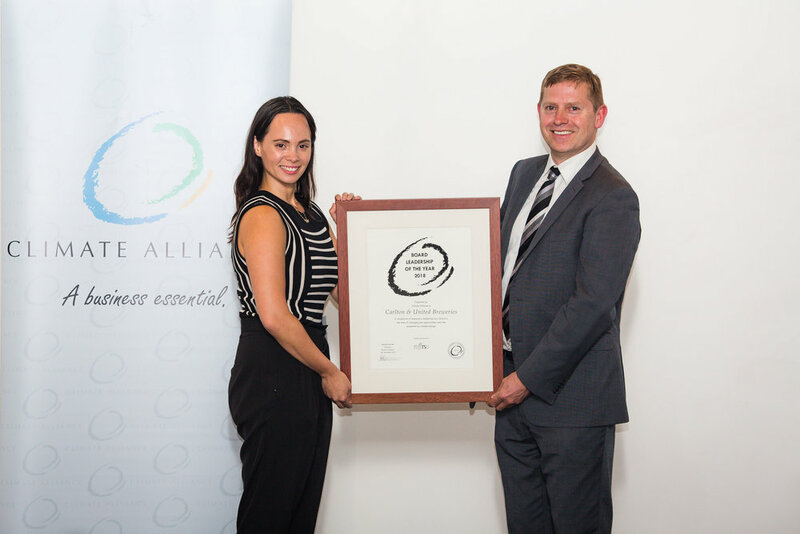 Board Leadership of the Year 2018 - Carlton & United Breweries, represented by Kirsten Sturzaker, Sustainability Manager at CUB with Turlough Guerin, Chairman of the Climate Alliance Board of Advisors. Innovator/Exporter of the Year 2018 - ShineHub, represented by Founder and Director Alex Georgiou, with Ben Scheltus, CEO of Climate Alliance. Business Leader of the Year 2018 - Fiona Simson, President of National Farmers’ Federation, with Rob Jamieson, National Practice Head, Environment at Ashurst, sponsor of the award. Innovator/Exporter of the Year 2018 - ShineHub, represented by Founder and Director Alex Georgiou. Business Leader of the Year 2018 - Fiona Simson, President of National Farmers’ Federation, with Ben Scheltus, CEO Climate Alliance. Our range of conferences and seminars address the opportunities and risks presented by climate change that can help you grow your business or company. These awards recognise executives and organisations who have demonstrated leadership in managing the opportunities and risks presented by climate change. Our website provides you with a centralised hub of relevant, business-related climate change news, resources and articles, so you don't have to waste time trawling through the web. We closely track national and international developments then write articles that give you valuable insight into business-related climate change issues and trends. Our regular newsletter that addresses a range of developing issues that are of interest to businesses like yours. Our range of networking opportunities help executives and Directors like you meet like-minded business leaders. Better understand the issues surrounding climate change and how they might affect your business? Help your company gain a competitive advantage? Voluntarily reduce your company's carbon footprint? Mitigate the risk from climate change? Then we can help you achieve these goals. Guiding you through the huge amount of available information on business-related climate change issues. Giving you impartial analysis of the range of alternative solutions. Translating the jargon and technical language into plain English. Giving you contacts within the business community who want to or already have achieved the goals you have set for your business. Become a member today and receive all of these benefits.